Hope you enjoy this little slide show of the SPA-tastic and SPA-sational Spas that I got to visit on the Magical Mayan Mystery Tour. The Memories of Magical Mexico and some of the many Magical Moments we got to experience while there! We visited 10 AMazing AMResorts Hotels from Tulum back up to Cancun and had such a great time at each and every one. So before you ask…”Which was your FAV”…let me reply as I have many times before…”I am the Leopardo Mamma and I think of each of the resorts and TEAMS as my Leopardo Cubs and I LOVE THEM ALL”…If you want to tell me some of the things you are looking for for YOUR perfect vacation I am always happy to tell you of the things I find and love at each of the resorts I visit and love! So…lets start to “re-live” that Magical Mayan Mystery Tour! We started at DREAMS TULUM! We stayed there for 2 nights and got to see old and new friends alike! We loved what they have done with the “Preferred Club” rooms and the Lounge that they have created over in the “Hacienda/ Former Lobby” area! Its where the Coco Cafe is and the PC Lounge ROCKS BIG TIME! There are More plantings around the resort and it makes such a nice difference throughout as you are walking around! And of course we visited the Spa …LOVE…but then I am a “Spa Girl” and have never met an AMResorts Spa that I haven’t loved! Though the trip was all too brief, it is one that lives in mine and leopardo’s heart til we get to go back again. Because the DREAM TEAM at DREAMS TULUM ROCKS! 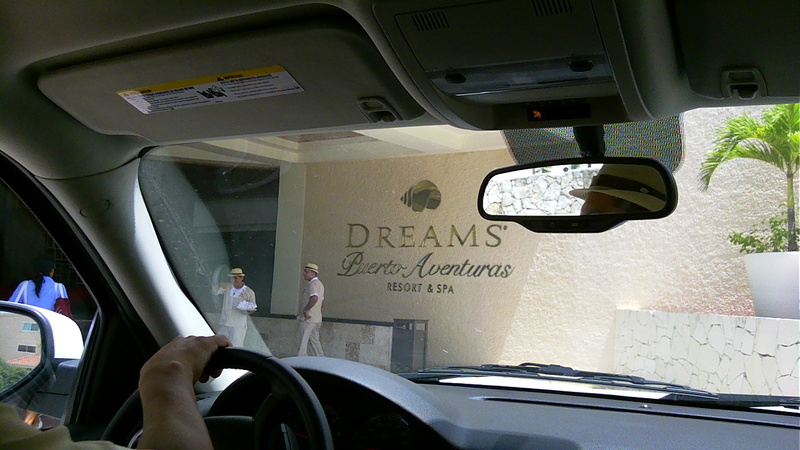 Next on the tour came DREAMS PUERTO AVENTURAS! LOVE THEM and the Location! Here we spent 2 nights also and got to be with dear friends and embrace new ones! Leopardo and I just LOVE that! The DREAM TEAM there ROCKS, they really do! The location is great! One of the reasons we love it so much is because from the Resort you can walk into the marina and the Dolphin Discovery Area, just a 7 minute walk and you get to walk around and see the Dolphins and the little shops and eateries. Very NICE! Another thing about the location is that the beach is very “cove like” and for parents with children …they are never far away and you can watch them while you are under a Palaypa and they are spalshing by the shore! There are just so many things I love about Drems Puerto Aventuras, these are just two! You have to check out the SUNdial News letter you get so not to miss the shows! We saw the Fire and Water Show when we were there! Its a WOW and must see! And of course we went to the spa… It is so special and I love the outdoor garden and Jacuzzi there…very intimate as is the whole spa…a very special vibe for sure! Secrets Capri was stop number three and sadly we only could spend one day here but we sure packed a lot into our time there! From the time we arrived to the time we left we were snapping all kinds of pics to share, then, now and even later…just SO MANY! We had lunch at Seaside Grill with the SECRETS TEAM and learned all that is new and happening there! 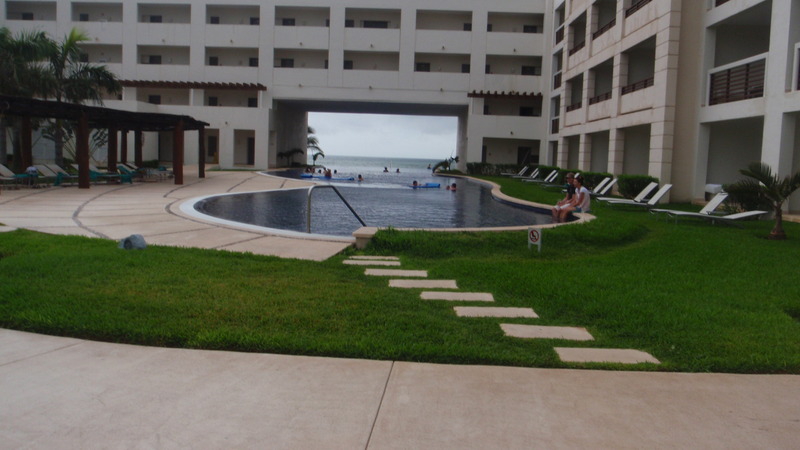 We had a great view of both the Ocean and the Pool…and let me tell you…EVERYONE we saw was having an AMazing TIME! Lots of smiles and laughs all over! We toured the spa but didn’t get any treatments because we wanted to meet their Wedding Coordinator and other team members and get as many pics as possible. Later had dinner in the Wine Cellar which was over the top delicious and one of the things that is available to purchase. And in my opinion well worth the purchase for a lovely romantic dinner that goes above and beyond! Got up early the next day to get up and take Beach Pics and Videos…and the beach was so calm and beautiful I even took a dip myself and savored the MOMENT! The water and the beach were GREAT! Soft Sandy and no shells or coral I went bare foot and it felt so good! So many SWEET and SPICY SECRETS at Secrets Capri! Then we headed over to see NOW Jade! AND LOVED our MOMENT of NOW! When you think of the GEM of JADE you COOL, HIP and LOVELY and That is what NOW JADE IS! Leopardo and I loved our stay there! The TEAM THERE really does ROCK! One of the things we love the MOST about NOW Jade is the fact that they truly embrace nature and GREEN! I love the Mangrove Reserve that is in front of the resort, I walked there one morning and all of the birds and sounds of nature just brought a wonderful serene feeling to my soul! The food and Drinks were all top notch from Breakfast to Pure, gotta try their French Toast! To Lunch and Dinner all around you can go wrong and its all so good! The drinks around the resort were all great too! We loved the Shows and the Entertaiment Team and all the FUN things always going on around the resort! The lobby is cool and chic as is the Preferred Club Lounge and so many places that you look around the resort! The restaurants each different and their offerings all so good! I loved the beach and Ocean there and the pools! 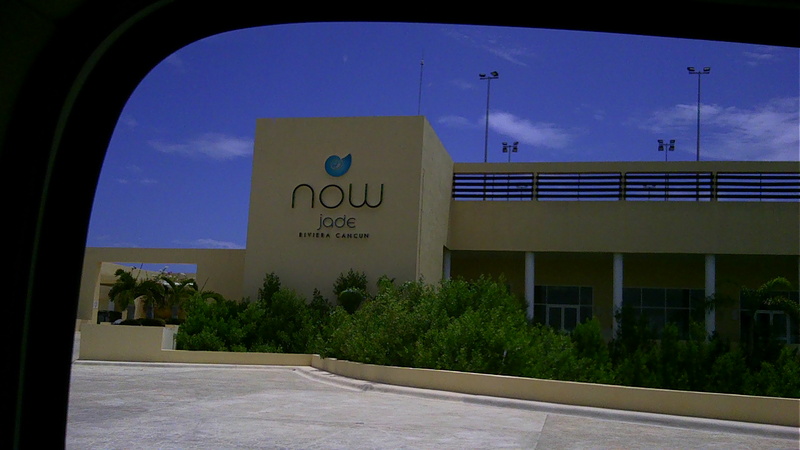 Leopardo and I LOVE NOW Jade and can’t wait to go back and experience even more of the GEM that NOW JADE TRULY IS! 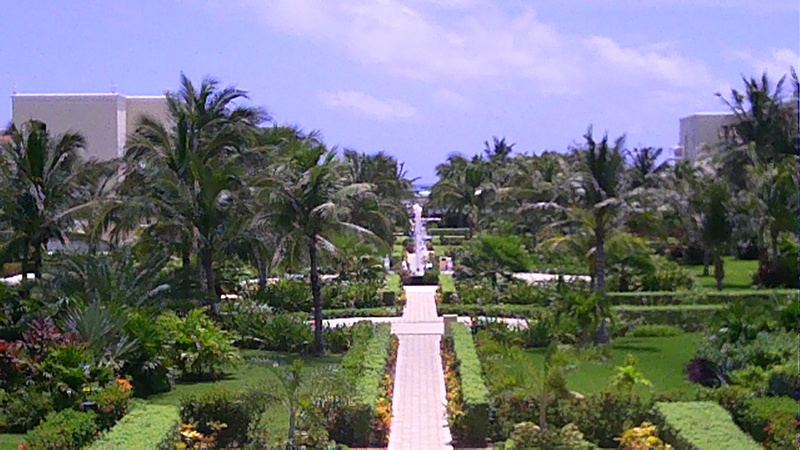 Next on the MMM (Mayan Magical Mystery Tour) was Secrets Maroma…Where the Secrets are WARM AND WONDERFUL! Secrets Maroma also has a very special place in our heart… LSeopardo and I stayed at the Preferred Club and after dropping our bags off we called room service for a DELISH Sandwhich and a glass of red wine and unpacked a bit then off to the SPA! Even though our time there was short Leopardo and I packed a lot into it! The Spa, Dinner with a Dear Friend Alex head of the entertainemnt team at Portofino, The Mayan Show and drinks after at the Theater to chat with some guests who were leaving the next day and couldn’t say enough GREAT Things about their HONEYMOON! We got up early to go to the beach and snap some pics and that BEACH and OCEAN called us in and we had such a great Swim! Later in my room ordered some Room Service, Coffee and Toast delivered promptly and HOT! We were sad to pack but before we left we got a whirlwind tour of the NEW GYM location along with the great new Palyapa roofing that makes it easy for guests to get about the resort even in the rain without getting wet! Thanks Rafael for the TOUR! 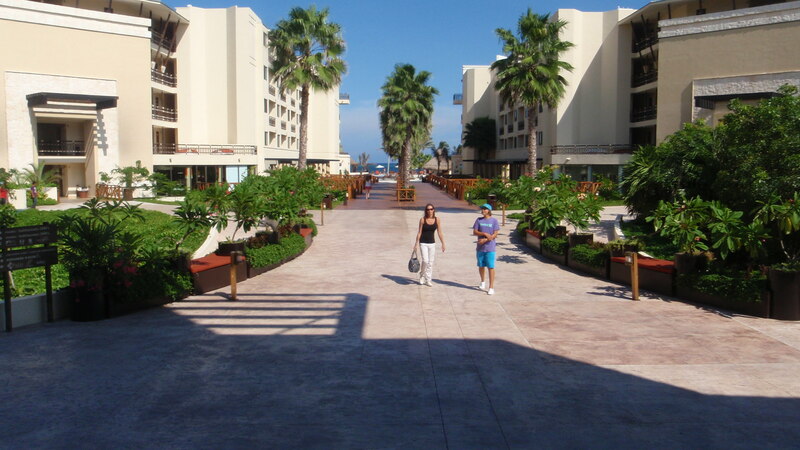 From there we headed off to Dreams Riviera Cancun and WOW WHATTA SWEET DREAM THAT IS! Leopardo and I just love it! From the moment we stepped into the Lobby, then onto the Preferred Club and then our ROOM! WOW Whatta View from the Room and what views all around the resort! 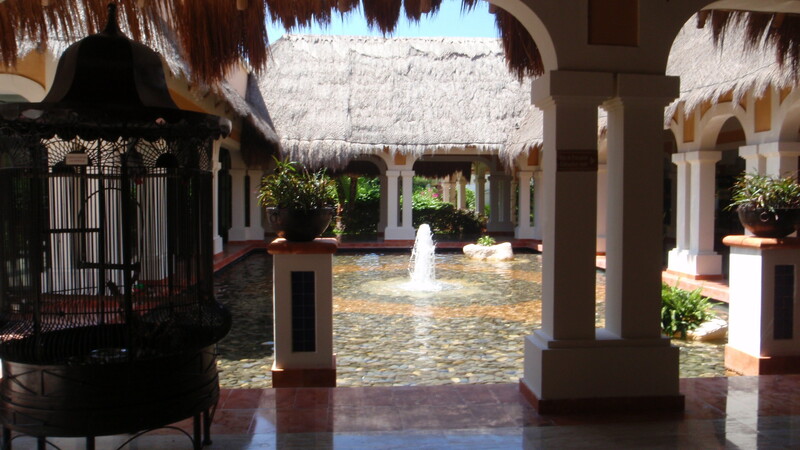 The resort has such a wonderful Tropical Elegance about it it… Hacienda meets Bali meets WOW! After I dropped my bags off and plugged Leopardo in to make sure that he was going to be up and running and ready to “Spread the LOVE and Share the DREAM” I called the Spa to check my appointment and before I could post we were there Pedro from the Spa came to get me and walked me to the spa where I fell in LOVE with yet another AMazing AMResorts Spa! The Spa at Dreams Riviera Cancun truly is an OASIS of Relaxation and makes “Sweet SPA DREAMS” come TRUE! We had a great tour and got lots of pics and had an amazing treatment! Then a FUN dinner in my room where some Dear Friends joined me and we feasted on Room Service it was DREAM COME TRUE! The Beach and Ocean are a DREAM COME TRUE TOO! And we got to enjoy them and the Pool…it was hot and they felt so good along with the great drinks that just are so delicious! We got to tour the resort with Magdelina who is part of the Wedding Team there and were impressed with her and all the resort offers BRIDES AND GROOMS to make WEDDING DREAMS COME TRUE! Again we packed a lot into our special time there…and even have the pics and videos to prove it! Over 500 put who’s counting! Going again…and to NOW Sapphire! Ah…what do you think of when you think of the GEM Sapphire…Cool Blue Ocean and Lovely Blue Sea meeting to make Magic Moments…well that is NOW Sapphire! It truly is a GEM..in every way! The beautiful Hacienda touches feel like a warm HUG from a Special Friend and that is how you are treated there…like a special friend … the worlds Mi Casa Su Casa come to mind…My home is your home…is how you feel as NOW Sapphire makes you feel right at home and pampered! So many Magical NOW Sapphire Moments…remembering them all makes Leopardo and I know that we will be back to make More of those Lovely Memories again… NOW Sapphire where the Sapphire Blue of the Sky meet the Blue of the Sea and make Magic Moments of NOW…SAPPHIRE! Next stop…Zoetry Parasio de la Bonita! Zoetry…where LIFE, ART and ZEN meet to Make MAGIC! And YES this is so true! Zoetry Parasio de la Bonnity truly IS MAGICAL! From the moment you walk into the lobby and see all of the ARTful Details, to the Beautiful Views all around and the ZEN that is found at their Thalasso Spa…Life truly does meet ART and ZEN and make Magical Zoetry Moments! After Leopardo and I went to our room and got him all hooked up thanks to Zuko and the IT guy who worked magic! Leopardo was getting fussy and needed some HELP! LOL! After touring the spa I got the Jenku Water Massage…it was the most amazing and soul touching experience I have ever had at a spa! I recommend it highly to anyone visiting Zoetry! While we were there we got to take a ton of pics and videos that we love sharing…there is just so much beauty there! And a MUST TRY is the FRENCH TOAST at Kaax for Breakfast I first fell in love with it last year and the LOVE Affair of me and the French Toast still goes on! hehehe! Try it while you are there and you too will know what I mean! Zoetry…where LIVE, ART and ZEN make MAGIC MOMENTS! Leopardo loves to travel…and these “Road Trips” are so much fun for the both of us! On to Secrets Silversands where the Secrets both Special and SILVER! Silver is a NOBLE Metal I’ve been told and I believe it…the lovely shine of silver and the gorgeous things that can be made with it…So when I tell you that Secrets Silversands are both Special and SILVER…know that they truly ARE! As soon as you arrive you can see the SILVER all around…the details shine and glimmer and make MAGIC as you wander around looking at all the CHIC Touches that ABOUND THERE! From the Lobby, to the Grounds, to the Spa to the Preferred Club to the Restaurants and everything in between! Leopardo need help again … poor boy was really starting to get worn out but Salvador to the RESCUE…My Dear Friend worked his magic and Leopardo was up and running or should I say PURRING! hehehe! Then off to lunch, then the spa, then dinner at the Wine Celler and the show…so much to fit in and my camera was spinning…but we were ready with 3 extra batteries and another camera to get all the shots to share with all the SECRETS FANS that love Secrets Silversands! Secrets Silversands where the SECRETS are both Special and SILVER…and too SWEET not to be shared and Leopardo and I lvoe sharing them with you! Dreams Cancun…the last stop on the Magical Mayan Mystery Tour…Last perhaps but certainly not least…Leopardo and I LOVE Dreams Cancun and its DREAM TEAM! And this trip was just as special if not even more than the others before it! Saul our buddy took us to our room and got leopardo up and running…that poor leopardo boy was almost on his last leg by this time…I sure had worked him hard…10 hotels in 14 days…but HE LOVED IT and SO DID I! Thanks Saul for working magic with the leopard boy! After that was a surprise lunch at Oceana where they even decorated with a leopard table cloth! What a wonderful and special touch that was…any wonder we love the DREAM TEAM there! AND as if that wasn’t enough we got to meet and lunch with Eduardo and Elana who have been coming to the resort for 30 years and my Dear Friend Iris…and the DREAM TEAM it was an AMazing FEAST for the eyes and the TUMMY…The food, the wine the company the whole AMazing Exprience was a DREAM COME TRUE! Though the visit was short Leopardo and I got a ton of pics that we were able to share…because we love the SHARE THE DREAM that is DREAMS CANCUN! There are so many special things about this resort…from the Dolphins, to the two beaches one on each side of the resort…but the most special is the DREAM TEAM…each and every staff member who works to make your DREAMS COME TRUE! On Saturday Morning we hot up and walked around the resort to take our last pictures then came back to the room and download them…Leaving is always hard…but its easier when we know we will be back and also know that we carry the DREAM TEAM with us in our hearts. Dreams Cancun…Sweet DREAMS and 200+ pics! Leopardo and I just LOVE DREAMS CANCUN! What can we say…Great Location and AMazing DREAM TEAM in place! We had such a good time catching up with Dear Friends and embracing NEW Familia while we were there! 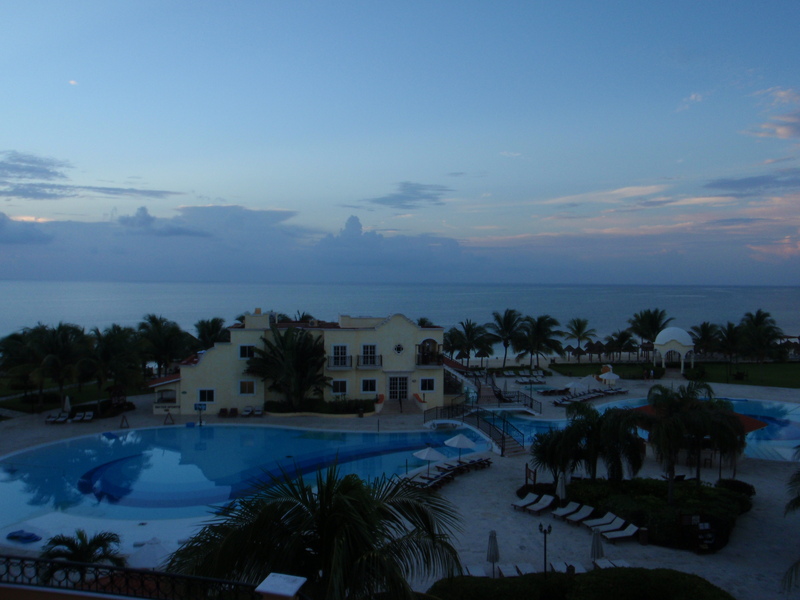 Click on the link below to check out why Leopardo Laptop and I just LOVE Dreams Cancun! We feasted with new and old freinds, got to enjoy the spa there…one of our FAVS, saw our Dolphin Friends and so much more…a visit that was way too brief but we still managed to take over 200 pics! We got to meet the Famous Elana and Eduardo! They have been coming to the hotel for over 30 years! They and the DREAM TEAM and some friends sat down and had a DREAMY FEAST for LUNCH! They even had a Leopardo Table Cloth in honor of Leopardo! LOVE THE DREAM TEAM at Dreams Cancun! Love and Miss Dreams Cancun but carry them all in our heart til we return again! Secrets Silversands Sweet Secrets are shared…over 200 photos! Tonight Leopardo Laptop is sharing SWEET SILVER SECRETS, the ones we loved at Secrets Silversands! If you click on the link above you can share those SILVER SECRETS! 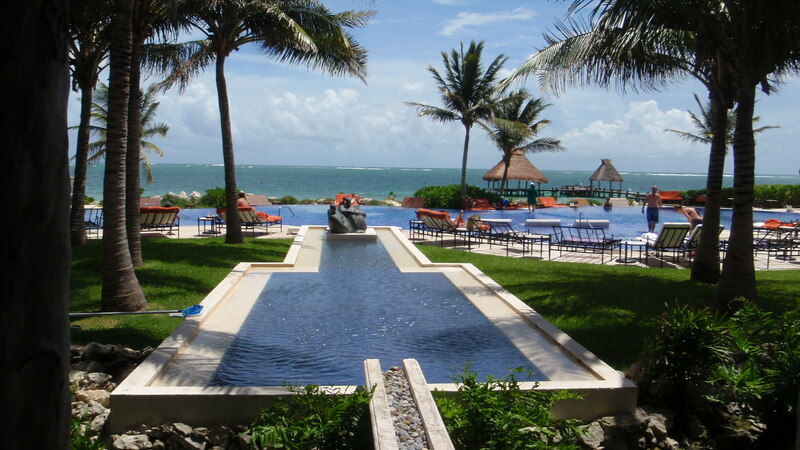 We loved Secrets Silversands…The pics show the room we had in the Preferred Club, along with the Spa, and Dinner in the Wine Celler, lunch at Oceana and so much more. Hope you enjoy looking at them and of course I would be happy to try and answer any questions you may have. We loved our stay there and keep Secrets Silversands in our hearts til we return again! Zoetry Parasio de la Bonita, Where LIFE, ART and ZEN meet more than 300 pics UP! There are pics of the Presidential Suite, The Spa, The 2 pools both the main pool and Thalasso pool by the spa, Food Pics and so much more. Please feel free to take a look and share some of the “LIFE, ART and ZEN” that was so Magical at Zoetry Parasio de la Bonita and why Leopardo and I LOVE IT so! NOW Sapphire, Magic Moments Re-lived! Pics are UP! Old Leopardo Laptop has been a busy boy this afternoon…but he is so very happy because he got to re-live again some Magic Moments that he and I shared at NOW Sapphire! What do you think of when you hear the word “Sapphire” The Cool and Soothing Blue GEM that makes you daydream of soothing ocean and blue skies above.. Thats what Leopardo and I think of and it makes us think of why NOW Sapphire is so aptly named and of all the lovely Magic NOW Moments we had while visiting them there… NOW Sapphire and their AMazing TEAM truly do make this a GEM of a Resort! Please click the link below to come along with Leopardo and I as we re-live our Magic Moments of NOW at NOW Sapphire, where the beautiful sapphire blue of the Ocean and Sky meet to give Magic Memories that you will hold in your heart forever! Leopardo and I will keep the Magic Memories in our hearts and look back at them with smiles… We love Now Sapphire and will return to make more of those Special Sapphire Memories! Leopardo is missing Mexico and his friends at Dreams Riviera Cancun…so we just went through out pics of our stay there and posted over 500 pics and videos. If you click on the link above you too can see Dreams Riviera Cancun through our eyes… We loved our stay there from the Master Suite with that gorgeous view…to the SPA which is so relaxing and has great services…to the beach and all the FUN activities that are always going on…so make sure and check your SUNdial Newsletter each day so you don’t miss out on a thing! Leopardo and I loved our time there! So go and enjoy and have SWEET DREAMS!